On a cloudless September day in Palmdale, California, over 2500 people gathered to witness the dawn of a new age of space flight. Hundreds of families traveled to experience the event firsthand, and hordes of reporters stood by eagerly with cameras in wait. As the crowd's anticipation grew, all eyes focused intently on a large airfield hanger, soon to reveal the next generation of space vehicles to an enthusiastic crowd. Moments before the unveiling, authorities announced, "We are about to enter a new era." This spacecraft, they predicted, would allow humanity to exploit the new frontier of space, to expand our knowledge, and to explore the cosmos "for the benefit of all mankind." Space flight, they further claimed, would become a routine enterprise, in which all nations cooperated in the exploration of the heavens. The hanger doors soon opened, and the spacecraft slowly emerged. Spectators cheered wildly. While reporters snapped hundreds of photos to capture the scene, onlookers marveled at the craft's size and novelty. Among its most discernible features, the ship's name stood out in big, black letters painted across the hull: ENTERPRISE. 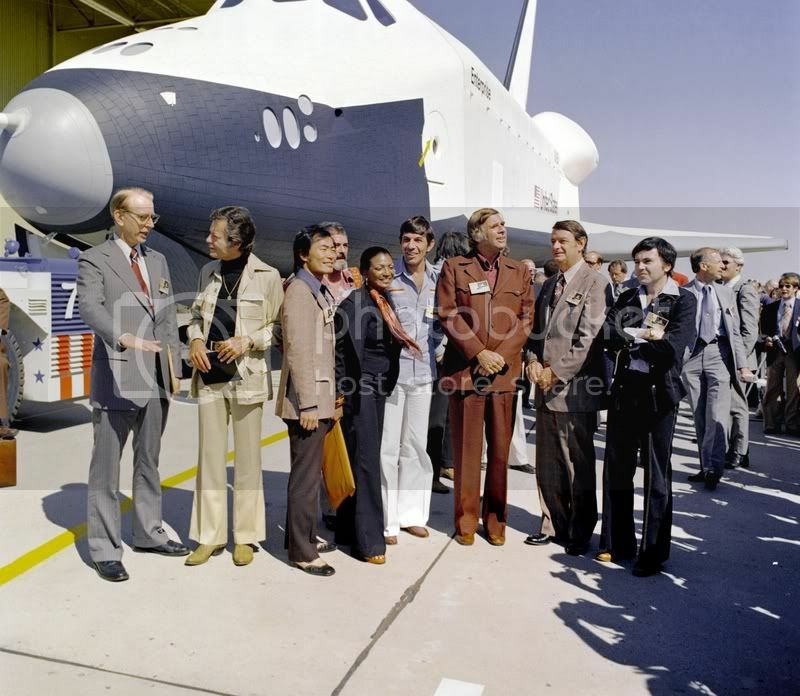 Gene Roddenberry, Leonard Nimoy, Deforrest Kelley, and most of the original cast were present to give her a send off. They smiled as Alexander Courage's Star Trek musical score blasted on nearby loudspeakers. The year was 1976. Although many Star Trek fans know that NASA's first reusable space vehicle was named Enterprise, the story of how that came to be is rarely told. It was not NASA's first choice. Certainly, NASA personnel were "Trekked out" during the 1970s, and many engineers and scientists confessed to being devoted Trekkers. Yet, top NASA officials were not so bold (or crazy) to suggest naming the Space Shuttle after a fictional starship from a cancelled television show. Indeed, it is hard to imagine NASA administrator James Fletcher walking into President Gerald Ford's Oval Office and announcing, "Mr. President, we'd like to name this seven-billion-dollar spacecraft in honor of the guy with the pointy ears." It was not going to happen, especially during a time of increasing public and political scrutiny of the space agency. Instead, NASA had picked the name of Constitution, not only as a celebration of the bi-centennial in 1976, but also as a symbolic tribute to the American "way of life" within the broader contexts of the Cold War and the continuing U.S./Soviet Space Race. Constitution was a obvious and logical choice. Bjo Trimble, the most famous and influential fan in Trek history, launched a new letter writing campaign in the spirit of her earlier Save Star Trek campaigns during the last years of the show. Using mailing lists from conventions and advertisements in fanzines and newspapers, Trimble pleaded with fans to send letters and petitions asking that the name be changed to Enterprise. Could there be, she asked, any more fitting tribute to the space program? This new epoch of human history would be symbolized by Gene Roddenberry's optimistic vision of a future of international cooperation and social harmony. Wasn't that better than a nationalistic or Cold Warrior-ish designation? Soon, the White House was flooded with thousands of letters. It is not clear how many were sent, but most reliable sources estimate between 10,000 - 40,000. Faced with this deluge of Trekkers, President Gerald Ford casually remarked to NASA chief James Fletcher in a late afternoon meeting, "You know, I'm a little partial to the name Enterprise." Ford did not mention the letters or petitions. Instead, he claimed that he liked the name because he had served aboard a Navy ship that serviced an aircraft carrier of that name. Fletcher then objected, but was immediately overruled by Ford. It is also possible that Ford preferred the name Enterprise for other reasons. Not only did the word conjure up images of human endeavor, but it also hinted at cost-effectiveness and profitability, two characteristics that Ford desparately hoped to associate with the expensive space program. While Trekkers rejoiced at the news, many journalists and NASA critics denounced the decision, depicting the name change as a "press agent's coup" or an obvious NASA publicity stunt. However, others applauded the decision. The New York Times, for example, remarked, "Tribute to all forms of imaginative entertainment that have spurred interest in space and science this past century is long overdue." It then asked NASA to consider naming the next shuttle The Jules Verne. To many Trek fans' dismay, the Enterprise never orbited in space. Instead, it was used for test flights, one of which stacked the vehicle atop a 747 jet. Nevertheless, it was a huge grassroots victory for Star Trek fans everywhere. They should be proud of this accomplishment. Not only were fans able to save the show from cancellation in 1967, but they also influenced governmental policy at the highest levels.